Canon 400mm f5.6 L EF Neoprene Lens Cover & protection Woodland Green. - Quality 3mm thick neoprene (poor protection if any thinner, thicker can get in the way). - Comfort and insulation from handling cold lenses. The lenscover includes a detachable velcro panel for the zoom section that can be used when the lens is fully exteneded (400mm). Quality 3mm thick neoprene (poor protection if any thinner, thicker can get in the way). - Protection of your lens from knocks and scrapes. We manufacture our lens covers in the UK using the best quality materials. 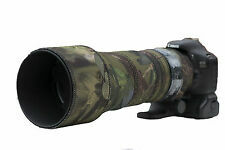 New Sigma 150 - 600mm Sport Protective Neoprene lens cover Woodland Green Camo. - Quality 3mm thick neoprene (poor protection if any thinner, thicker can get in the way). - Comfort and insulation from handling cold lenses. Canon 350D 400D 450D with 18-55mm Lens. 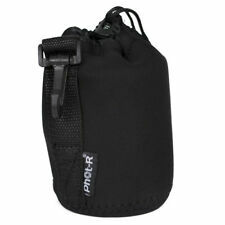 Neoprene material, soft, lightweight, elastic and easily to carrying. Material: Neoprene. On both sides of the with a bit. GBP 2.88 56 sold. GBP 2.79 738 sold. 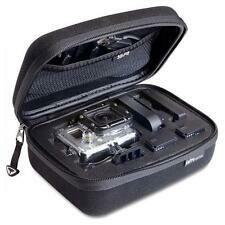 Aquatech Soft Wrap DSLR Body case. 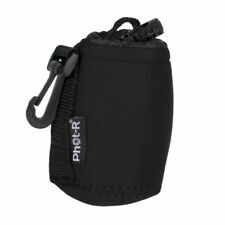 Neoprene Surf Photo Camera Case NEW. Condition is New. Dispatched with Royal Mail 2nd Class. Now also included is the cover for the zoom tube in matching camo. The Neoprene is lined on the inside in black and is reversible if you prefer plain black. All the lens covers I make are made by myself by hand on a lock stitch and overlock machines, all the edges are overlockedmaking a more secure and better edge. Tailored for Sony a5100. Alpha 5100. Compatible with: Sony a5100. The Neoprene is black on the inside and is reversible if you prefer plain black. The windows are covered with crystal clear vinyl. (The single piece shown in green in our picture). -Canon EF 2x II . Woodland Green Camo (reverses to black). -Canon EF 2x III . - Reversible cover with camouflage one side, black the other. Tamron 150 600mm G2 Neoprene Lens Protection Cover. - Quality 3mm thick neoprene (poor protection if any thinner, thicker can get in the way). - Comfort and insulation from handling cold lenses. - Protection of your lens from knocks and scrapes. 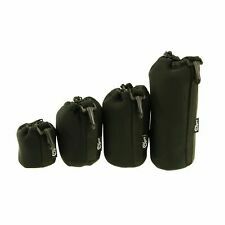 The zoom tube cover is designed to be loose enough so the lens can slide in and out without having to be taken off and the wrap around feature is so you can take it on and off quickly without having to remove the whole set.